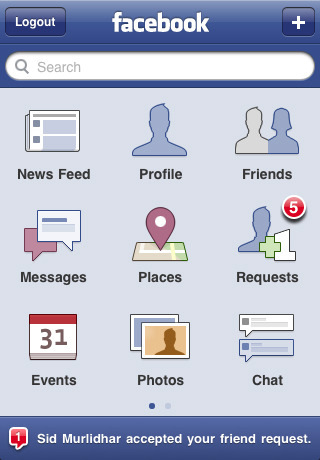 Update: The Facebook app version 5.0 was released on August 23rd 2012. This release has added significant performance improvements over the previous versions of the iOS app as they’ve actually rebuilt the app from the ground up this time around. You’ll notice that scrolling your news feed is now faster and feels smoother. You can now also tap the banner to quickly see your new stories, instead of having to refresh the tab. Open photos quicker and close them with a simple swipe down. Notifications have also been revamped in 5.0 to give you instant access. 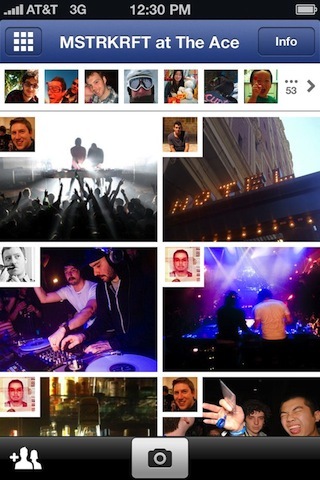 – The left navigation opens and closes much faster on the iPhone. – You can now post Status/Photo/Check In from your News Feed as well. – Messages and Notifications actually go away after you read them unlike before. – You will also now notice a lot of “loading…” screens on top of your feeds, which is the app trying to update its feed automatically. Technically speaking, the new version of the Facebook app has moved away from using HTML5 and the UIWebView and moved towards using native iOS for its application codebase. This gives the app a much faster performance since native iOS code allows the app to use the full power of the CPU and GPU in the device. You can read more about what changed under the hood on the Facebook website. 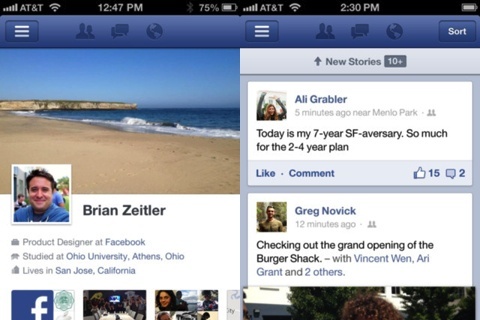 Below are the original Facebook app screenshots, updates, and review for your reference. Update: On Wednesday 8/18/2010 Facebook rolled out Places, and on the 19th the iPhone and iPod touch app were updated with the new Places icon. Using Facebook Places you can checkin from where you are, and also see where your friends have checked in. The loaction based service is similar to that of foursquare and Gowalla amongst many others in the geotracking genre of services. Once you grab the update, the new Places feature might not be ready for you yet, if you see this message “This feature will? be available in your region soon” the you’ll have to wait till Facebook releases it for your area. Most of the U.S. should have places in about a week. Update: Facebook is going to be adding photo and video sharing features to their iPhone app soon, which is aimed at competing with new iPhone startups such as Instagram, Path, With and Color. TechCrunch today revealed screenshots of the photo sharing additions coming to the Facebook iPhone app which are duplicated on the iPad side with the native Facebook iPad app. Facebook has been on the iPhone for a long time now, with the free Facebook app giving you quick and easy access to your Facebook status updates, friends, messages and more. Masterminded by famous developer Joe Hewitt the Facebook iPhone app the updates 3.0 version is now out which utilities the 3.0 OS on the iPhone to add a ton of new functionality. The visual interface of the app had improved somewhat and a bunch of new features have been added. Here is what is included in the new version of the Facebook app for iPhone. AppSafari review of Facebook was written by Joe Seifi on August 20th, 2010 and categorized under App Store, Contacts, Dating, Events, Featured, Photos, Portals, Social. Page viewed 16482 times, 1 so far today. Need help on using these apps? Please read the Help Page. wow i really want an itouch!! Video Uploader for Facebook Quickly Upload Videos and Photos to Facebook directly from iPhone. Capture the perfect moments on your iPhone’s camera and instantly share with your friends on Facebook. Geotag your photos. This app is terrible! It crashes like crazy, and when it doesn’t crash, it runs really slowly. It hardly works with new 4.0OS (or 4.0.1). The interface is okay, but not the best. And updates for this app are few, and way to far in between. In all, if you want to use Facebook on your Iphone, use safari. The BEST Facebook Photo uploader – the easiest and fastest way of uploading photos from your iPad to Facebook. Quickly Upload Videos and Photos to Facebook directly from iPhone. Share photos and videos with friends and family on facebook. Pls can I have the facebook on my iPhone???? I have been liking the new display of newsfeed, timeline or groups on the left, active screen center and chat to the right BUT there are time that the left screen is just white. I cannot select to go to my newsfeed or to my timeline or any other activity. How do i refresh so that the screen is active again. This has happended a few times and it can take anything from 6 to 24 hours to reset to be active again. I don’t know why it goes away and I don’t know why it comes back. I think there are some improvements to be made on this app. It’s still not as easy as using Facebook on a desktop. who does not use facebook today, no?